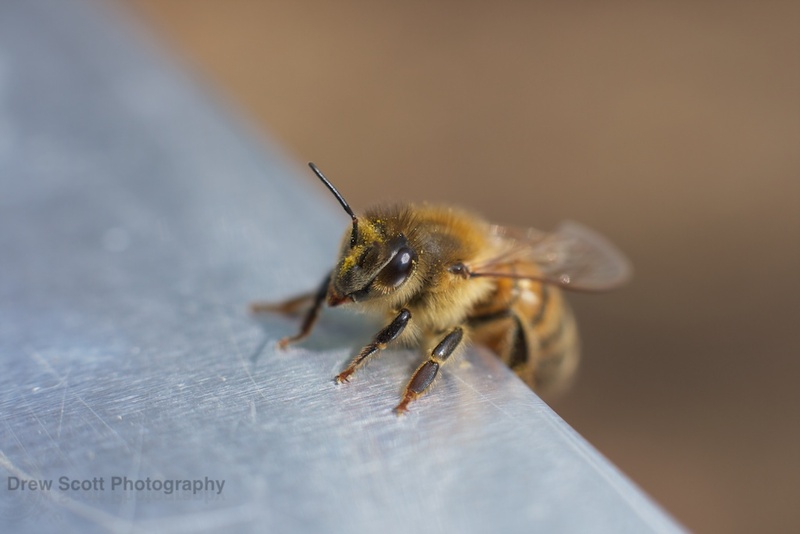 ← Bee macro shots by Drew Scott…and queen news! “What are you doing tomorrow?” John Chapple had asked Emma and me, “Would you like to help me at Osterley?”. 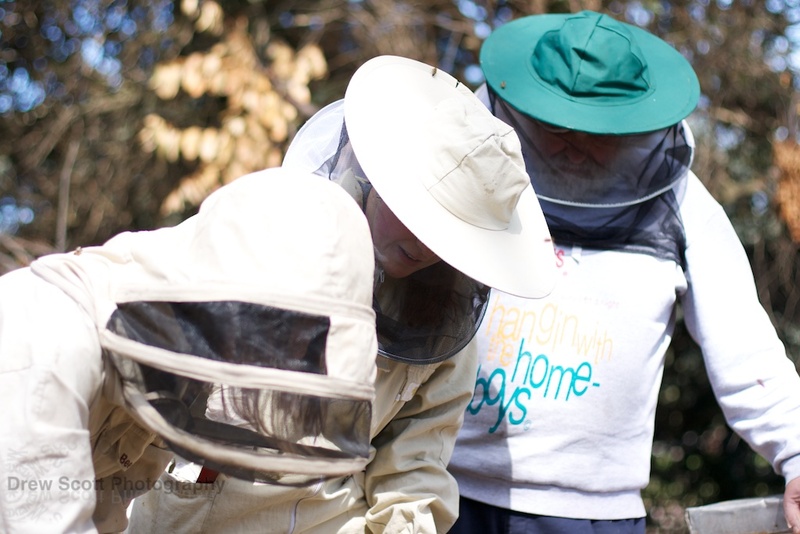 Well, when a beekeeping legend invites you down to some hives it would be madness to say no! Osterley is a National Trust property near where I live, with beautiful gardens which Drew and I like to picnic in. It has ponds, woodland and meadows so is perfect for bees as well as the horses, cows, rabbits, ducks, geese and swans that live there. The hives there don’t belong to John but to a few members of the Ealing association, who had kindly offered to let us make some nucs up from their bees. 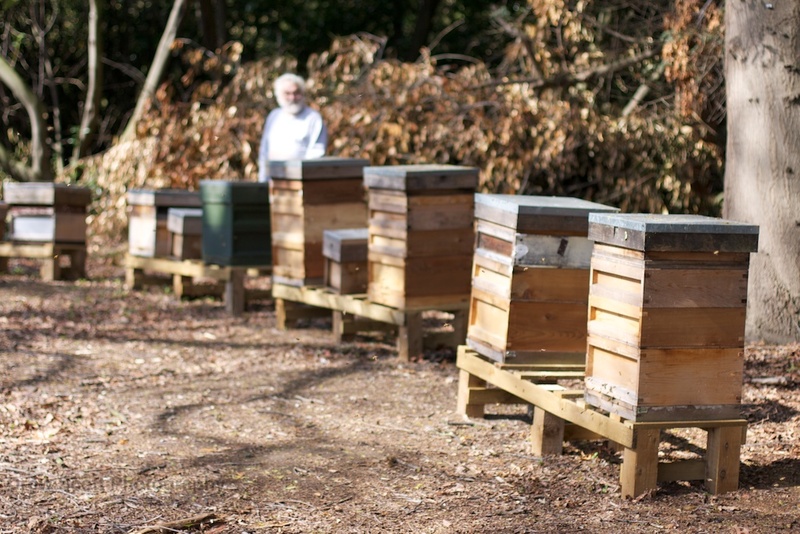 The nucs will be used to build up the stock in the association apiary, which only had five hives left after winter. A long distance shot of John with the hives. They are in a lovely sunny spot. 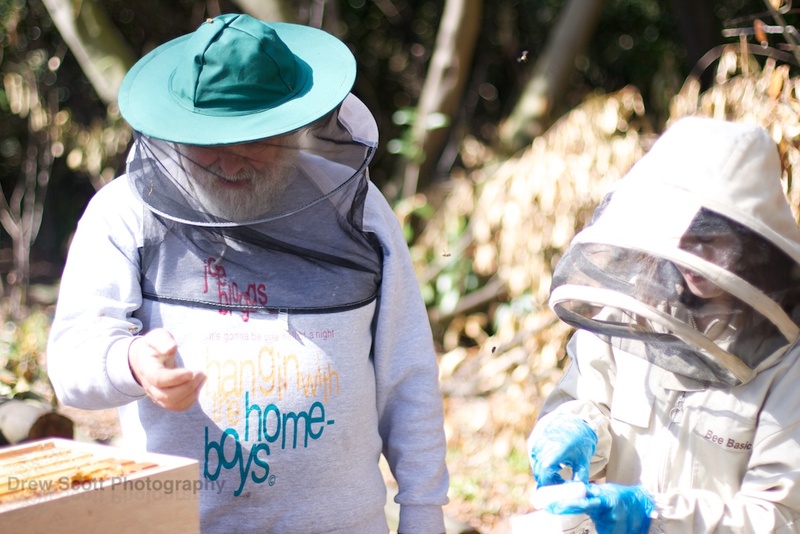 As a master beekeeper, John has a fine beard. Emma and I are mere novices so have no beard yet. Of course we didn’t have a clue what we were doing (or at least I didn’t anyway) but John patiently directed us. 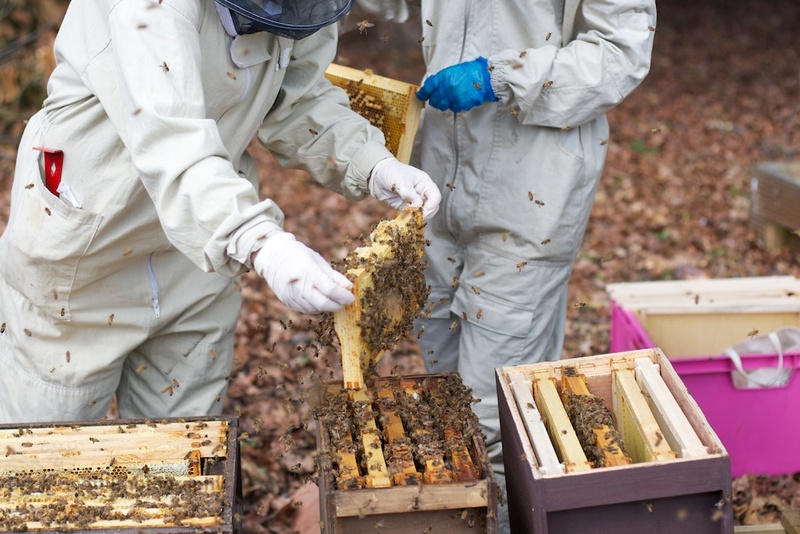 There were six nucs to be made up (nucs = mini nucleus hives, for building small colonies up). We went through each parent hive finding the queen first, then separating her off and putting some brood and stores from her hive into a nuc. John had ordered in some yellow Italian type queens from New Zealand, which recently arrived. One of the little queen cages was put into each nuc, fondant upwards so that any dead attendant bees in there wouldn’t fall on the fondant and block the queen’s exit. The workers will nibble through the fondant gradually to let the queen out, getting used to her smell whilst they do so. 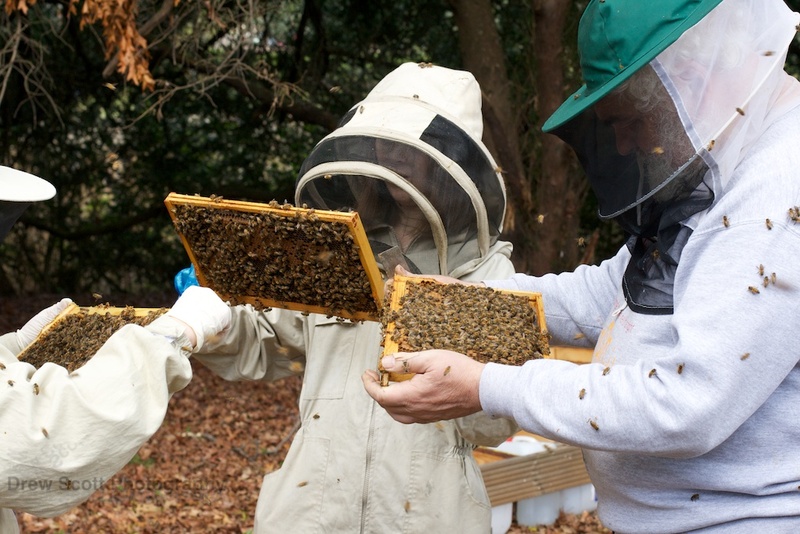 As well as the bees already on the frames, more nurse bees were shaken into each nuc to make up numbers. At first we were doing well at spotting queens (all un-marked btw). John even spotted a tiny virgin queen in one hive, and triumphantly pulled another adult virgin out from her cell – calling it “a cesarean birth”! But about four hives in we got stuck. The bees were on a one-and-a-half brood box system. 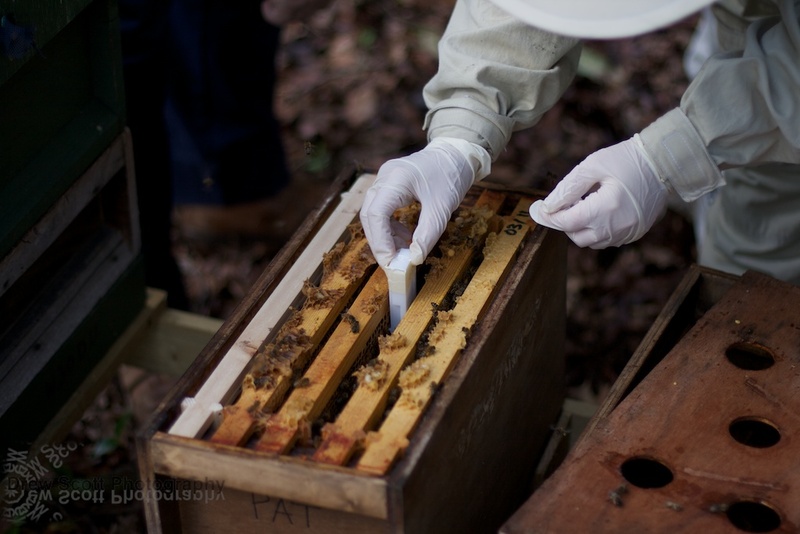 We kept going through the boxes again and again, inspecting the bees at the bottom and sides of the hive too. We passed the frames between each other, triple-checking every single frame. Nothing. Eventually John came to the conclusion that the hive was queenless, as there were no eggs either. To test his theory, he put one of his caged New Zealand queens in there, to see if the bees would be attracted to her. “If there is a queen in there, she’ll come running over”, John said. No queen came rushing over, but I was surprised at just how quickly workers carpeted the cage, eagerly sensing her pheromones. John decided they liked her, and left her in there. We each got stung once, in the finger. Below is a pic of John just after he got stung. I’m not sure he notices it much by now! With all the disturbance to the hives there were plenty of workers like the one below with abdomens up in the air to reveal their Nasonov glands, fanning their wings to spread the scent. It’s an aroma used to mark scentless locations such as water or a new colony location. 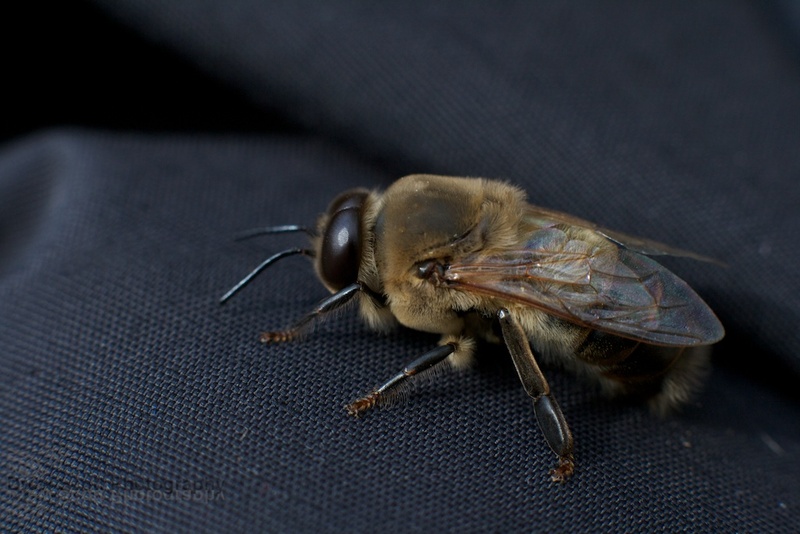 When a virgin queen leaves the hive to mate, workers will mark the entrance with Nasonov pheromone to guide her back. On the first sunny day for ages, the workers were also going mad bringing all sorts of pollen back in. Some was brick-red, so the horse chestnuts must be coming out. And all the hives had plenty of big butch drones. Swarm season is here! It was a fun morning. Many thanks to Drew for taking the pictures and for waiting whilst we played hunt-the-queen! This entry was posted in Uncategorized and tagged John Chapple. Bookmark the permalink. Absolutely fantastic pics and great story! Thank you so much…I just love the pic of the worker with his little body up in the air. Just glorious! By the way, I have nominated you for the “Sunshine Award!” Congratulations!!! (See my blog for details). Thanks so much for the award, that is very sweet of you! The pictures are wonderful! I was wondering how much protection those thin gloves give you–but then you did say you got stung. The latex gloves have their pros and cons. They are too thin to offer protection from stings, but they do make you less clumsy than leather gloves, so that you’re less likely to get stung. They’re also more hygienic. It was actually my fault I got stung….there were bees flying everywhere and one landed on the smoker bellows without me noticing. I then went to puff the bellows and squashed one into my finger as I did so. Ouch! I have been looking out for signs of it, but nothing so far! 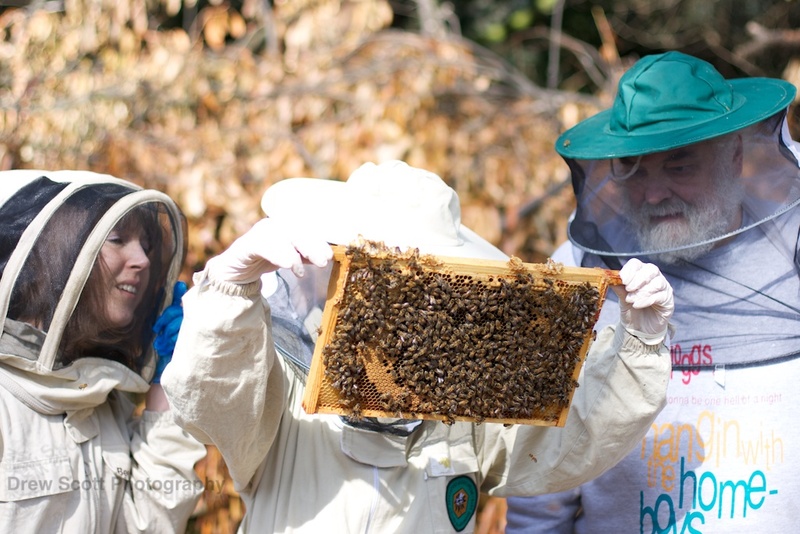 How about you, have you developed the start of a beekeeper’s beard yet? If I ever did, Courtney would pluck it out one by one. She’s made it quite clear that facial hair is a no-no. Being a compost champion sounds fun! Drew was wearing a loose veil but not a suit. He told me afterwards that he felt a bee inside the veil on the back of his head, but he still carried on taking photos! That was pretty brave/insane of him, I would have run away screaming instantly! Your blog is as interesting as ever! I’m always excited for a new post to see what new adventures you all have had. Thanks 🙂 Maybe I can find a convincing beard wig somewhere. Fantastic photos and great information, as usual! Thanks very much 🙂 Drew is really on a roll with his photo taking. Thanks! Poor Emma has not been too good this week, her hand swelled up and she’s had to wear a sling. This was her first sting ever and it looks like she’s somewhat allergic. Hope she can carry on, luckily our bees are very gentle which is how she’s managed to escape being stung up till now. As ever, I enjoyed following your blog! I always learn something! Hope your stings are going down…. I got my first nasty sting last week when I did a cut-out of some black ferals bees from a rental house. My ankle swelled up like a cantaloupe for about a week! Love your pictures! Thanks 🙂 Your sting sounds really bad, must have been tricky walking. 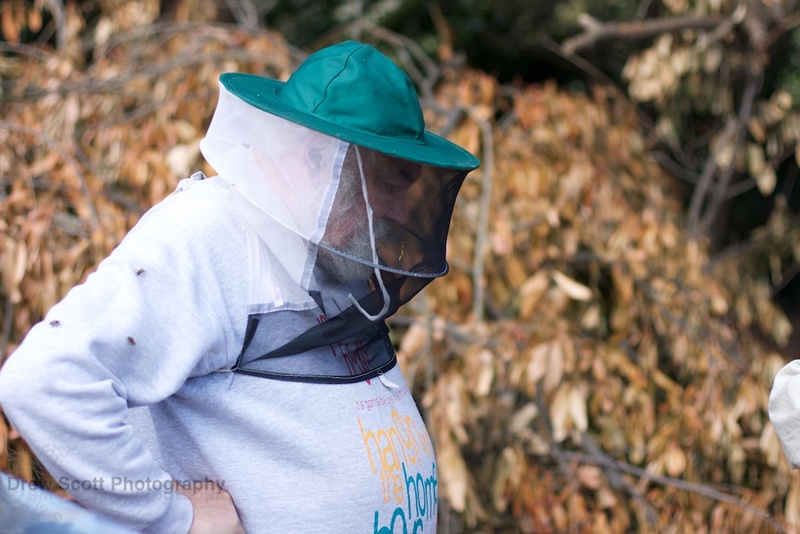 The things we go through for the love of bees! What goes on in a beehive is a little miracle. I love reading about it!! It’s the closest I’ve ever been to any of this–through your blog. The picture you got of the bee covered in pollen is amazing. Using their Nasonov glands to mark a return path for their queen after she goes out to mate….wow! Much as I would love to claim credit for the pics, they were taken by Drew, my official photographer-in-residence. The more I learn about bees, the more fascinating I find them! I am sure there are still many more bee secrets we are yet to learn. Ah, yes, I see his name all over them now. Tell Drew he captured some fine moments there. It was a great day! We were so lucky to have that morning of enchanted sunshine before the rain returned. We’d better keep Pat’s bees and David’s bees well apart at the apiary, imagine the trouble they could cause together! 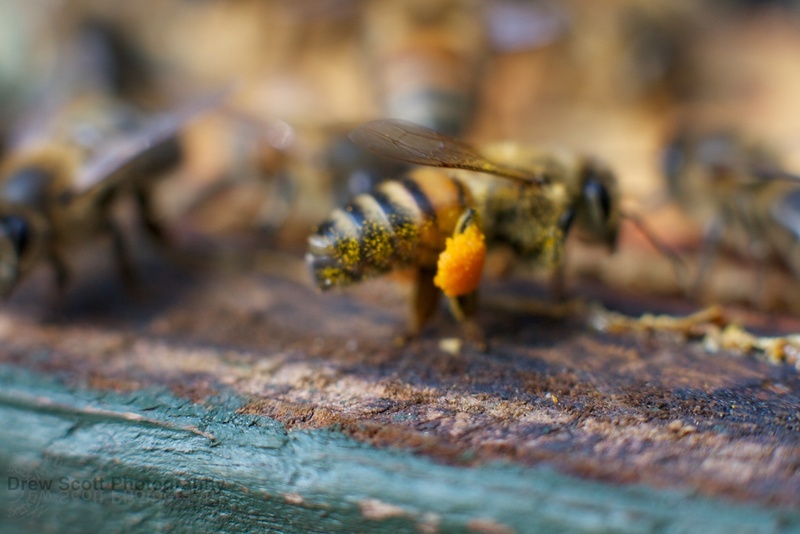 Let’s hope our ladylike bees will show the fierce bees to be less stingy. 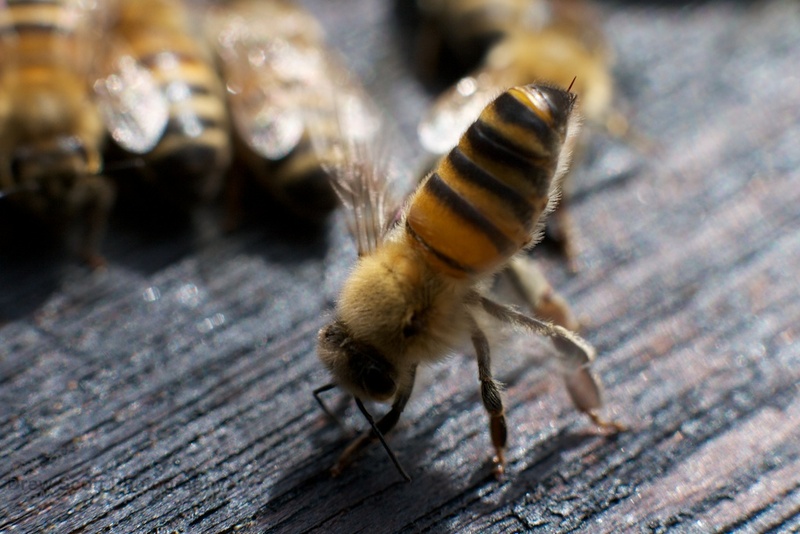 The photo of the bee with it’s bum in the air is terrific. I’m not sure how I would cope with the constant awareness of the possibility of being stung (coward that I am). Oh – walkers are like that too, the old and grizzled ones all have beards. Drew was actually taking much greater risks than me and Emma, as he did not have a proper bee suit on, only a loose veil. At one point a bee got in the veil and he carried on calmly taking photos before walking away and shaking it out. I would not have been so calm! But then I know how much a bee sting under the eye hurts. Great blog & photographs. Good source of information for a novice like me. Thanks. It was a really fun day, I’ll always remember it.